House Minority Leader Themis Klarides, at podium, and Senate Minority Leader Len Fasano, left, criticize Gov. Dannel P. Malloy’s budget cuts. At right is Connecticut Hospital Association CEO Jennifer Jackson. Minority Republicans in the state legislature called Tuesday for bipartisan negotiations to reverse last week’s $190 million cut to hospitals. And House Minority Leader Themis Klarides, R-Derby, also called for Gov. Dannel P. Malloy to approach state employee unions for concessions to help balance the current budget and mitigate a deficit approaching $1 billion that must be resolved shortly after the 2016 state elections. Also Tuesday, hospital leaders warned that funding cuts ordered by the governor last week – coupled with hundreds of millions of dollars in state tax hikes since 2012 – would force many facilities to begin laying off workers. 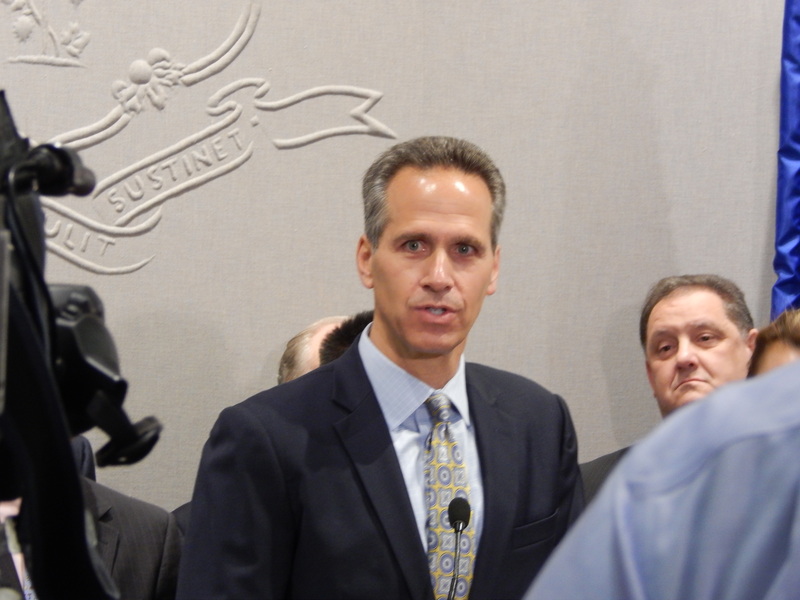 “The governor’s reckless cuts directly threaten the financial survival of many Connecticut hospitals, threatening health care access and quality and most likely hurting Connecticut’s most vulnerable,” said Senate Minority Leader Len Fasano, R-North Haven. The GOP leaders were responding to $103 million in emergency cuts Malloy ordered last week to avert a deficit in this fiscal year’s budget, which began on July 1. Chief among those cuts is a $63.4 million reduction in Medicaid payments to hospitals. That also triggers a loss of approximately $128 million in matching federal dollars. These funds, though outside of the state budget, also would otherwise be transferred to hospitals. Counting both federal and state funding, the cut to hospitals amounts to $192 million, according to the legislature’s nonpartisan Office of Fiscal Analysis. Hospital officials said the cuts would lead to job losses, service cuts and delays in purchasing new technology. 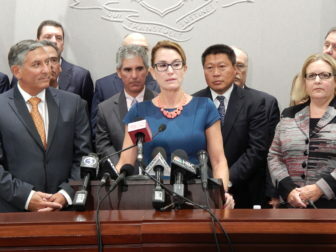 Connecticut Hospital Association CEO Jennifer Jackson said hospitals provide many health promotion programs in their communities, but some of those will have to be cut. “People are going to lose their jobs at a time when we dramatically need job growth in the state of Connecticut,” Jackson said, calling the cuts “a crisis situation.” The recent round of rescissions are particularly challenging because they give hospitals little time to adjust to significant funding cuts, she said. Griffin Hospital President and CEO Patrick Charmel said the cuts threaten hospitals’ efforts to change how they deliver care, part of a broad shift in health care away from paying separately for each service and procedure – which is widely viewed as rewarding those who provide more care – to tying compensation to keeping patients healthy. Doing so requires investments, hospital executives at the press conference said, which the cuts make harder to do. All of that is at risk, Charmel said, including the basic care hospitals deliver now. His hospital in Derby is facing a $3.6 million cut from the rescissions. “Quality is going to suffer,” said Dr. Stuart Marcus, CEO of St. Vincent’s Medical Center in Bridgeport, which is facing a $13.9 million cut. In any other industry, efforts to improve quality require making investments first, he added. But Connecticut is cutting cost and hoping that quality improves anyway, he said. Marcus said the cut his hospital is facing “pretty much wipes out our margin,” which he said was needed to reinvest in care. “These are devastating,” Marcus said. Some critics of hospitals, including the Malloy administration, have pointed to the seven-figure salaries of some hospital executives. Jackson acknowledged that hospital CEOs are “well-compensated,” and said it was necessary to retain the brightest and most capable. But, she added, “I find the argument not significant to the overall conversation,” and noted that the state has given tax breaks to corporations with CEOs who make significantly more money than hospital leaders. Malloy’s budget chief, Office of Policy and Management Secretary Benjamin Barnes, said last week the latest emergency cuts were ordered in response to lower-than-expected income tax receipts and the drop in the Standard & Poor’s 500 stock index for the first nine months of this calendar year. The administration lowered projections for income tax revenues this fiscal year by about $100 million. But after watching the administration order emergency cuts at three times last fiscal year – and still close the books with a small, $70 million deficit – Fasano and Klarides said it is time to stabilize state finances for the long-term. With both Republican caucuses opposed to tax hikes, Klarides said those talks also need to include state employees, adding that Malloy should approach the unions for concessions. Roughly 35 percent of the state budget goes for state employees’ salaries and benefits. Another 10 percent involves municipal aid – most of which is spent on public-sector labor. And nonpartisan analysts already are projecting a $927 million deficit in the 2017-18 fiscal year, the first budget that must be adopted after the 2016 state elections. In addition, Barnes said last week that the weakening income tax trend could roll out into future years, a problem that could push the 2017-18 deficit beyond $1 billion. Republican legislative leaders did not discuss any potential spending cuts Tuesday other than savings from labor concessions. Republicans called for more than $630 million in wage freezes and other concessions last spring, along with restrictions on overtime spending, to help avoid cuts to state social services. Malloy said last spring the GOP’s call was unrealistic, given that workers had granted concessions in 2009 and 2011. Puglia did not address Klarides’ call Tuesday for new talks with unions for concessions. The spokesman for one of the largest state employee unions, Council 4 of the American Federation of State, County and Municipal Employees, said Klarides’ call for more givebacks Tuesday is misguided. Union leaders have argued in recent years that Connecticut’s income tax system needs greater progressivity, with higher rates on the wealthiest. Malloy and the legislature did boost the top marginal income tax rate in the new budget from 6.5 to 6.99 percent. The top rates in neighboring New Jersey and New York are 8.97 and 8.82 percent, respectively. And New York City residents face a top combined state and municipal income tax rate of 12.7 percent. House Speaker J. Brendan Sharkey, D-Hamden, who criticized the Democratic governor for targeting health care and social services with his emergency cuts last week, opted to side with Malloy, however, following Tuesday’s GOP press conference. Sharkey specifically aimed a jab at Rep. Melissa Ziobron of Hamden, the ranking Republican representative on the Appropriations Committee, who posted a comment on her Facebook page last week supporting the governor’s cuts. Senate President Pro Tem Martin M. Looney, D-New Haven, also criticized the hospital cuts and said he hoped Malloy would reconsider. “These cuts will have a multiplier effect – jeopardizing federal reimbursements – adding to my concerns about the financial viability of the smaller, community-based hospitals with potentially devastating impacts on patient care and the workforces of these facilities that are in many cases the largest employer in a community,” Looney said in a statement.